The products that I am going to talk about today are semi matte. It isn’t too matte or oily it’s just right for the skin to glow without stickiness or being too matte. These types of foundations are good texture to give natural skin without expecting too much of coverage. I don’t recommend to people who have severe oily skin type. This product became popular when it was released on the magazine. I tried it using it with, sponge, brush, and hands however it works well using hands to apply lightly. It settles very well and feels like there is light protection lid on the face. The product constantly emphasizes on the moisture but the moisture doesn’t last long enough to feel after the application. It just makes me feel that skin tone was naturally became organized. As like the name it’s just a skin foundation. It doesn’t really show if the person has makeup on but just organizes the skin tone. It said to give great coverage with a little bit amount however is mid low saying that it lacks on the coverage. If you think it covers well for your skin, then your skin is consider to be on the good sides so don't have to spend too much money on buying expensive products. There are much other products to be satisfied with by spending half of money of this price. The problem is the persistency. I applied very lightly and I don't think it well last long so I applied again. Nevertheless when I looked at it on the mirror after several hours some areas are erased. I wiped it off with the cleansing tissue and there aren’t hardly any makeups to be seen. My skin type is not that oily usually having long persistent however this product really makes it bare face so not recommend to oily skin type. People who like to have light makeup will be satisfied with this. It’s not heavy and lighter than BB cream. There isn't any oily texture and gives light finish so useful to use without using a powder. However it doesn't make it too dry or matte. If middle skin type person uses well, it gives slight glow to her face however using the powder on top would take away the glow so avoid using the powder. If it's a dry skin type, you might feel the moisture on the morning only and feel empty past noon. So recommend to people who have clear skin and has middle type skin. It will organize their skin tone and make it look very neutral. Some people who use Korean or Japanese brand foundations would have experience different color to their facial skin compare to their neck color. So usually they have to mix with other products. However for Bobbi Brown without choosing the really wrong color it would naturally match the skin color. It helps the dark skin to looking healthier by bring the natural color to the face. However the price is too expensive to buy as a skin foundation. When I hear about Aqua I think that it should be very moisturizing as if the skin has drank lots of water. However many brands in Korea can’t feel the moisture on the products that said to be Aqua. However! When I tried this I felt really moisturizing and shout out Eureka! After several hours however the moisture disappeared. Even though it disappeared the glow was still left on the face. This product is good to be used for middle skin type without using a powder. When you touch it, there isn’t any stickiness or too dry feeling. I don't recommend to dry skin type or middle oily skin type. They have to find more oily products. I was surprised by the coverage when I tried this. The blotches have not gone away but the light once has. Covering the light ones is not that surprising however for this kind of texture and light coverage giving some glow would be hard to do so. So comparing to the light feeling coverage it’s very satisfied. It doesn’t totally cover the red blemishes but revise the skin tone making it look clear skin. The glow adds onto the face where there aren’t hardly any red blemishes showing. It can apply lightly with the hands but when you don’t focus it might hard to achieve light coverage. So covering the face using light amount of foundation over all and use some more on the area you need to cover. The Guerlain products are always in high price. However for this item it’s different. This was 2,000won cheaper than Bobbi Brown skin foundation. I would rather buy this because SPF is higher and plus + in PA which makes it to 3. However there is some problem, the color is too dark. It will be hard to brighten up the face if your skin is too pale. If you want your face tone to be pale as powder than you can’t find a color from this brand. #31 is bright enough but there is much yellow tone that can’t be used for a bright tone skin. If there is enough amount of red tone on your face than #31 will be fine. Even #01 would be fine if there is red tone on the face. If your face is pale but have some uneven tone, I don’t recommend this. Instead of being bright its more on natural skin tone. If your face has some red tone without blotches and wanting to use semi matte foundation should really consider this product. Try the product out from the department store not onto your hands or chin line. At least try on half of the face if the color goes well with you. In the online it said to be darker. The price is slightly over 10,000won and it’s 45ml. I tried onto my friend’s face. On the half of the face, Etitude House Dream On Foundation and on other Bobbi Brown skin foundation. 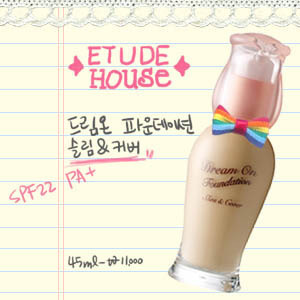 Also for another friend, Etitude House Dream On Foundation on the half and other half with Gurline foundation. I asked them to choose which side was the expensive foundation. They couldn’t guess and end up guessing. So meaning if you aren’t that sensitive, you can’t tell the difference. Especially on the moment you apply or someone is applying for you or even when you have clear skin. I tried on as well Etitude House Dream On Foundation on the half and other half with Gurline foundation. However I felt the difference, Etitude foundation had finishing was really light and fresh. Even after several hours, the moisture lasted really long. But there wasn’t a feeling where you can the settle emotion like Gureline foundation. 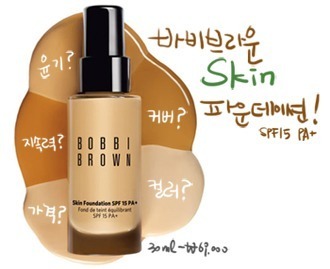 Also comparing to the Bobbi Brown foundation, there isn't much difference on the coverage. The one good thing about Bobbi Brown is giving the ‘perfect skin tone’. I bought #01 Light Beige. I don't recommend to people who have yellow tone on their face. If the skin tone is more reddish it will be better to use this color if it’s little bit dull face tone #02 will be fine to use. In 2009 semi matte was popular even until to today. There is some glow but not too much and covers what it suppose to be cover but not to thick! There are more foundation being release and getting much better so it's glad thing for the dry skin type people. However when you try it, it doesn’t give the satisfaction. So be reminded that only moisture won’t be enough for dry skin type it’s hard to find a foundation that is persistent in moisture to apply very lightly. However for people who have severe pimple problems or blotches shouldn’t go for this trend. It could be used with a concealer but it will be hard to do if it’s all spread. If it’s a Semi matte foundation don't have to use a powder including the 3 foundations that reviewed on above. It helps to give natural glow to the face without the powder and healthy looking skin. However this is for normal type skin. It is middle dry type skin I don't recommend. Apply some foundation only to the place where you want to cover it. For middle oily type skin, if it’s too glossy on the T zone area apply some powder lightly. I don't really recommend this kind of texture for oily type skin. You might have to fix your makeup all day. It is better to use more matt products that have great in adhesion and coverage. Not recommended to severe dry skin type. Foundation is like a skin. Get the foundation that you are satisfied in texture, color, price, and persistence. It’s hard to meet a foundation that fits your skin perfectly. Have to look for a foundation with a focus and checking the type of the skin. So it’s better to have some note when you use a particular foundation about the difference and what’s happening to your skin. What factors do you have to consider when purchasing a foundation? There is no answer; it depends on the characteristic that person looks for. Can it really apply naturally giving some coverage? There are some foundations that are much lighter than BB cream. So don't think that foundation is thick and heavy. You like to use light foundation but can’t ever avoid the coverage. The base has to be done clearly so it gives flawless looking skin. So if you are not good in using color products, the clear skin tone will help to look prettier. The coverage that I look for is not totally covering the blotches, it should help the skin tone to look one tone brighter giving revision to the skin. The overall skin shouldn’t look uneven and evens out the skin tone. The overall face shouldn’t look oily. When the face meets the light it should shine on the forehead, top of the nose, and on the cheekbone. It should glow very naturally. If you apply several times where you want to cover, and the other parts shines where it suppose to will not look heavy or too thick. The foundation lasts long on my skin. When I use a foundation that said to be good in persistence it last until 7~8p.m. If the foundation is not really good in persistence than it goes for a half a day. So normally if you have adhesion when you apply it lasts long. So doing the test on the adhesion only can be hard to tell in the persistence. There is diversity of colors in foundation however it’s hard to find a product that matches. The products that are on sell in Korea; I use the brightest color. There are some products in other brands that have darker shades or brighter shades than usual. So the color varies in each brand. It is hard to find a color that goes well with Asian pale skin color. Some product might be too much pink or yellow tone. Some times there are products made in Korea that goes well for Asian skin tone. So don't only think about the brand itself but try out difference kinds of foundation to choose a color that matches your skin. In case of foundation, even though it’s expensive, people usually buy. There are many foundations where you can find in inexpensive cosmetic brands. There are varieties of foundation to choose from for different types of skin. I don't recommend foundations that are expensive because of the name of the brand. So try as many foundations as possible to find a perfect foundation.